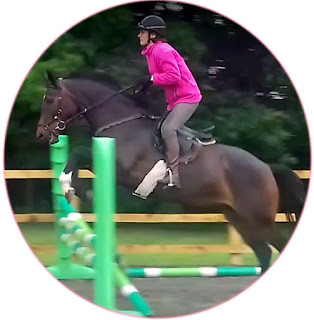 “I have been riding for about 40 years; through Pony Club, hunting, eventing etc and I have never had a horse or pony that I haven't managed to find a treed saddle for. Until Stella came along, I'd never even heard of a SMART saddle, let alone ridden in one. Stella is a 6 year old, 15.2 ISH showjumper. When I bought her as a four year old I didn't think there was anything strange about her conformation, she looked pretty well put together. But, two years and four saddles later, I still couldn't find anything that worked on her. Everything either moved forwards and slid round on her, causing ruffled hair behind the shoulder, or if it stayed put, it rubbed under the seat area. She would buck into canter, buck on landing from a jump and attacked me every time I put the saddle on. By the end of a hack, she'd be jogging, head shaking, snatching, trying to stretch her head down. She also used to drag her hind feet and square off her toes, and she was very crooked. I had a professional sit on her, who said she thought there was something physically wrong with her, so I had her checked by the vet. The vet reported she was totally sound. He scanned her ovaries and even tried her on Regumate in case her hormones were affecting her behaviour, but there was no change. I had always used a ‘proper’ saddle fitter and bought well-known, high quality saddle brands but Stella hated all of them. All through this, she lunged beautifully, so I knew it had to be my riding or her saddle. Given that she was even worse with the professional, I'd narrowed the problem down to the saddle. Research on the internet led me to Solution Saddles. I read all the reviews and decided I had nothing to lose, especially as there is the option of a trial service. I also liked the fact that the SMART PRO saddles look very like 'normal' saddles and there were people out there eventing and show jumping in them. I contacted Solution Saddles and was put in touch with an Approved Advisor, who answered my reams of questions before visiting me for a fitting. She was friendly, very professional, sympathetic and coached me through the trial ride. She stayed with us for as long as it took until I was happy. The after sales service has also been fabulous; the Advisor is always on the end of the phone - or even text - to answer my questions. Six months on, I have a totally different horse. She has stopped bucking completely, she no longer attacks me when I put the saddle on - she doesn't even bother to stop eating her hay as I tack up. She is much happier, more willing, and has stopped headshaking. The toe-dragging has stopped and she's much straighter. There are no rubs on her back, which is now more evenly muscled and in better shape. She's always loved her jumping, but she's come on massively in the last 6 months; I've gone from thinking her limit was probably 90cm – 100cm to thinking, there's probably much more here. Although the SMART PRO Jump seemed like an expensive saddle for me to purchase, I had a very difficult horse who wasn’t very nice to ride. Now, with the SMART PRO Jump, I have a rather nice mare with lots of potential, and I don't need to look for another horse as she's a keeper!